Inder Loves Folk Art: Green Machine. In lieu of a more fancy blog post this week, I am sharing a few cell phone pics and WIPs. Thursday night, Maggie went to bed early and I delightedly sat down to do a little sewing (uncommon on weeknights). Unfortunately, I also seem to have done something bad to my sewing machine, which won't take a single stitch now. The upper thread is getting stuck in the bobbin contraption below. So instead of spending a nice evening sewing and relaxing, I spent the evening tinkering and swearing. Friday I reviewed some YouTube videos on Singer bobbin case issues and did several more hours of cleaning and tinkering, to no avail. The machine still wouldn't stitch one single stitch. I will be honest: at this point, tears were shed. Steve told me I was upsetting Joe and needed to pull it together. I took myself to bed. Alas, it was not to be, and he called me yesterday to say that fixing my machine wasn't worth it and basically, did not interest him. So now I'm stuck with the other local place that takes weeks and weeks and charges $90 minimum and last time, didn't actually fix my machine on the first try. Sigh. I am not naming Mr. Grumpy by name because I actually quite liked him, gruffness and all, and the poor guy has enough negative Yelp reviews. If I had an older Singer I would go back to him in a heartbeat. I have long appreciated vintage sewing machines and sewed on a 60s Singer for years before getting my more modern machine. I must say, my current machine may not be as sturdy and long-lasting a machine as the oldies, but I do love the automatic needle-threader, stretch stitch, and other modern conveniences it offers. I also do not believe it is hopelessly broken; I think it probably needs a few new plastic parts and it will run for another few years. But I can appreciate that Mr. Grumpy prefers to work on older machines and I don't necessarily begrudge him that. He was at least quick in getting back to me and did not charge me anything for his opinion. So my regular machine will probably be out of commission for a good while, a very sad thought. 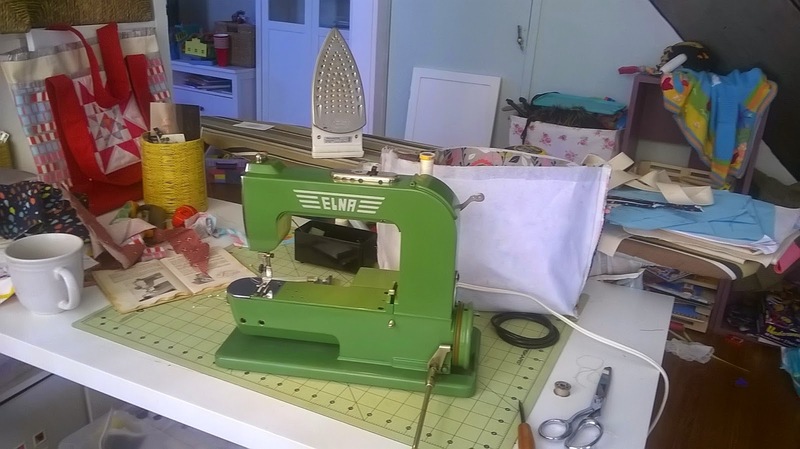 Yesterday I pulled out my "backup," my little 1951 Elna #1 (a.k.a. the Grasshopper) and got her running. She's a bit tedious to thread, and a bit slow and pondering (you can see I was trying different drive belts to see if I couldn't speed her up, but I think she was over-oiled and the motor parts may be slipping; I hope she'll sew better as some of that oil burns off). But you can't complain about the stitches themselves, the tension is absolutely perfect. She's a solid little straight stitch machine. The "problem" is that the Elna doesn't do zig-zag, and I don't have a zipper foot or buttonhole attachment for her. So this will limit my options as far as apparel sewing considerably. No knit fabrics (can't do zig-zag or a twin needle), nothing with buttons, and unless I hand sew them in, no zippers. But she's great for quilt piecing and sews through canvas and denim like it's butter, so I think I can enjoy sewing on her for a few weeks while I wait for my other machine to hopefully get fixed. And here's a sneak peek of the project I just finished, a gift for a friend. I am in love with Sarah Watt's designs for Cotton + Steel. I'm not normally that into designer lines, but this one just really tickled my fancy. Watch out, I might have several projects using it in the works! Maybe my next machine should be a Singer made between 1940 and 1965, eh? Oh, I hope you can get your machine fixed quickly! It's good you have a backup machine-- and such a fun color. I hope you can find some projects that can be done with just a straight stitch! Hope your machine is fixable! I totally understand you on the sewing machine frustrating- I've definitely had some tears over broken or mysteriously not working machines. But your Elna is adorable! It reminds me of an old Featherweight Singer that I have and used for all my first sewing projects. 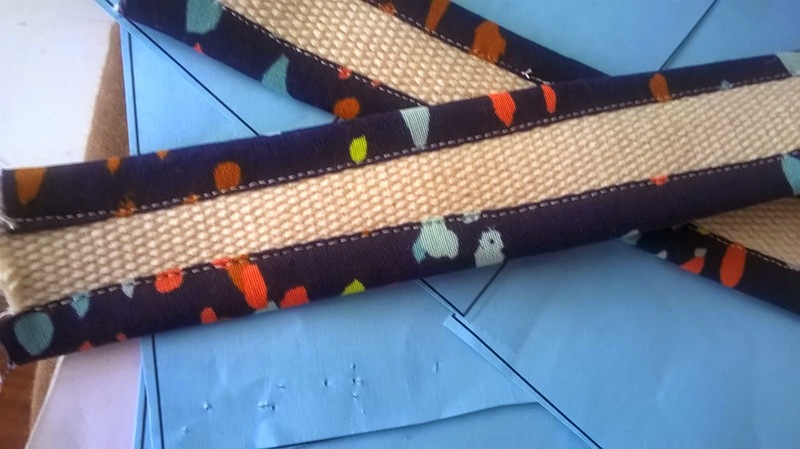 It only did a straight stitch (apart from some crazy attachments!) but it's perfect for piecing quilts and is so beautifully simple. And I love the divided basket!! 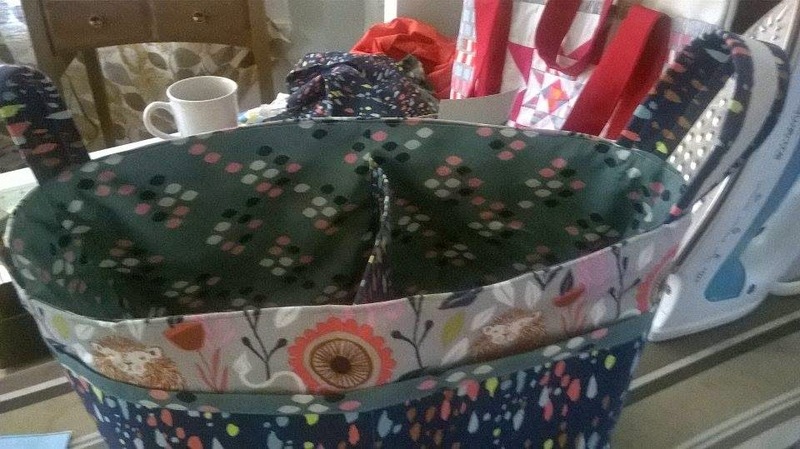 Having sewing machine issues is the worst! Makes me want to lose my mind! Excited to learn about the 60s Singer! I love your Elna! I hope your other one is fixed! Sewing machine tensions can be tricky, but you will find so much more fun when you understand how they really work. Poor quality stitches can ruin a whole project, but properly balanced stitches create beauty and function.